M. L. Taylor is from Pittsburgh in Western Pennsylvania. The mother of three grown daughters and two rambunctious dogs Jax and Potter. She is a nurse by day and a romance writer by night. She loves to write story where the heroine is both fragile and strong - and the hero is what ever girl dreams of when she closes her eyes. She has currently completed books 1 & 2 of the Heart Series, with book 3 coming out in the Fall 2019. In Follow Her Heart you will find yourself touched by the extreme abuse young Jessie is subjected to at the hands of her brother, Martin. The author, M.L. Taylor, gives just enough detail to her condition which allows you to understand the measures she would take to rid herself of his cruelty. As her scheme to cheat rich noblemen begins to play out, an unexpected man threatens more than just her game. Lucian is a peril to her future and she finds herself at his mercy at every corner she turns until he is the only thing left for her survival. Yet, they each must deal with their own demons before peace can be found. M.L. Taylor is exceptional in taking a topic, such as a nobleman falling for a poor girl, and twisting it to create a work all of its own. You will find Follow Her Heart is more than just a romance novel to enjoy as you become entwined in the lives of these two characters. The author's ability to weave suspense within the story line generates a web of possibilities as Jessie and Lucian's future unfolds. In my reading, if an author has the ability to make a reader want to cry, laugh, or get their heart racing, they are a good author; this book was more than good, it is outstanding. M.L. Taylor ends Follow Her Heart with the feeling there must be another book to tell the other half of Jessie's nightmares that haunted her. Follow Her Heart is a romantic work of historical fiction written by author M.L. Taylor. Set in an age of piracy, grimy docklands and fine wealthy gentlemen, the heroine of our story is the lowly Jessie Denton. Barely staying above the poverty line, Jessie struggles with the allure of her physical appearance and her relative weakness as a woman at this time in history. But she is tough and fights against her situation, just barely keeping her head above water, and dressing as a boy to play cards and dupe the rich men who want to challenge her. But, when one alluring nobleman catches her out for her cheating ways, they uncover a connection much more powerful than either of them has ever known. In a classic rendition of the two worlds colliding romance, M.L. Taylor really knows what to do to set a reader’s heart aflame. Sir Lucian Hawkins is the ideal young rich bachelor for this plot: a fit and agile young man with a bright mind and a sharp wit. He’s used to getting what he wants from life, so meeting a woman who captures his heart so completely is a big shock to his system. Jessie is a really down to earth heroine with relatable traits, despite the historical setting, and her emotional journey is sure to have Taylor’s readers weeping one moment and sighing the next. Overall, I’d highly recommend Follow Her Heart for all fans of low-heat level, heartfelt romantic novels. Follow Her Heart by M.L. Taylor is a historical romance set in the 1800s. Jessie’s stepbrother, Martin, spends most of his time drunk and beating on Jessie. On a night when he nearly rapes her, she escapes to meet up with her friends, Harlow and Perry. Jessie needs to get out of town before Martin kills her. Jessie and her friends have become quite adept at cheating at cards and, on this night, impersonating a boy, she joins the Mates Table with the intention of stealing enough to escape. She didn’t bank on meeting Sir Lucian Hawkins. Thinking Jessie is a boy and knowing that she had cheated, he waited in a dark alley, only to find out that Jessie was not the boy he thought she was. Her sapphire blue eyes stay with him and one chance meeting could change the world for both of them. Two very different backgrounds – can it work or is it doomed to fail right from the start? 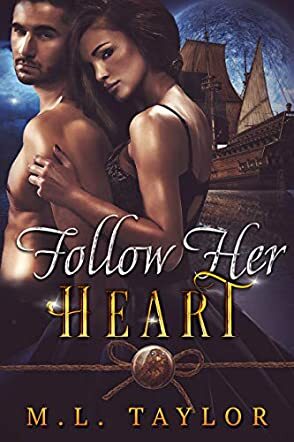 Follow Her Heart by M.L. Taylor is the first book in a series and it is some opening book! This book is not for anyone who is easily offended by graphic scenes of violence, of which there are a few. Warnings out of the way, this was a good book. It was very well written, very descriptive, and followed a decent plot at a steady pace. The characters were realistic, developed to the extent that you could get to know them and follow them throughout the story. I felt that the period the book was set in had been researched enough to ensure the details were right and, although it was quite graphic in places, I didn’t feel that it was too much or out of context. This is a very readable, enjoyable story with plenty of action; historical romance with a bit more added in! A historical romance with a beautiful setting in the first part of the 19th century, Follow Her Heart by M.L. Taylor follows the tale of Jessie Denton, a young woman who has had her share of physical abuse. But her life is about to change when she meets Sir Lucian Hawkins that fateful night at The Mate’s Table. Hawkins thinks she is a boy, and a cheat, for that matter, and he waits in the dark alley. But the encounter arouses powerful emotions in him. He knows he wants her in a way he doesn’t even understand. But can the gap between them be bridged? That is something the reader will want to find out. The prose is beautiful and the diction reflects the period, the backdrop against which the story takes place. Jessie Denton is a well-developed character, a symbol of the lower class, the runt of the litter that knows hardship and pain and that learns to survive through cunning. I enjoyed the focused writing, the emotional depth of the story, and the historical details that transport readers to a different time and culture.